With timely updates for its operating system, Apple has been in the top position due to its iOS leaving behind Android. But most of time, while updating the iOS to the latest version, users face an issue and see a message stating iPhone software update failed. Well, there might be lots of possibilities behind "Software update is required to connect to your iOS device" issue. Some of them might be weak internet connection, incompatibility of the device, software glitches, and many more. Today we will take you out of this dilemma by offering possible solutions to this problem. How to Fix iOS Software Update Failed? Most of the times when Apple rolls out a new version of iOS, a notification is sent to the complete user base all over the world. Now image a scenario that everyone on this planet decided to update their iOS at the same time. What will happen? Well, there will a huge amount of traffic on the Apple servers and you will not be able to update your iPhone. And this is how users see the "iOS update failed" message. And if such is the case, all you need to do is wait for the traffic to lower down. Wait for some time and retry again with the process of updating. Restarting the iPhone can be helpful most of the times. It can unknowingly solve those errors that are difficult to crack. You can always try restarting the device. Here are the steps to restart your device if your iPhone says software update failed. Press and hold the Sleep key until you see the "slide to power off" slider. Once you see the slider, slide it down to switch off your device. Now, press and hold the Sleep key again till you see the Apple logo. This will switch on your iPhone X/8/7/6/5/4. If you are having the "why does my iPhone say software update failed?" question, then one main thing to remember while updating your iPhone to the latest iOS version is: you cannot update your iPhone on cellular data. 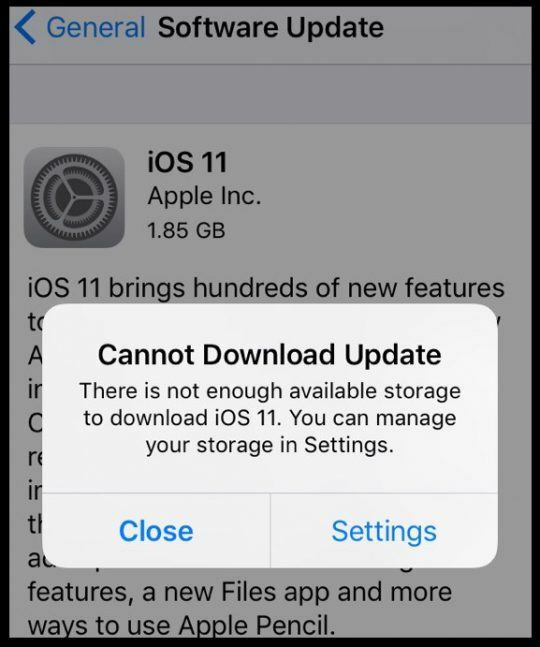 As the size of the update is too big, Apple advises the users to download using Wi-Fi. And if your Wi-Fi is not working, then there are high chances for the presence of iPad software update failed issue. All you need to do is check if your Wi-Fi is working or not. If not, restart your network router. If you feel it difficult to set up the network router, ask for help from your service provider. This might help fix your problem. 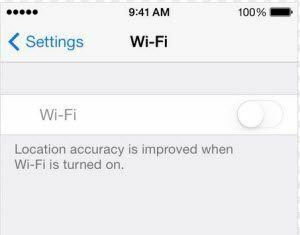 If you are Wi-Fi is working fine, then you should check for your device to see if it has any network issues. Your iPhone is not getting a good network and hence you reach to a point where your iPad update failed. Resetting the network settings might solve any issues related to the network and thereby solving your original issue. Here are the steps for resetting your network settings if your iPhone keeps saying software update failed. Click on the Settings app of your device. Once you click it, head to General. Look for Reset option in the menu and click it. Now, look for Reset Network Setting option. Once you find it, click on the option. Click again on the Reset Network Setting. This will do the job. If you are not able to update your iPhone, then there is alternate way to update it using iTunes. This process is very easy and a piece of cake. All you need to do is just follow the below steps to update your device using iTunes. Make sure you have the latest version of iTunes on your PC. Plug your iPhone to your PC. Run iTunes and choose your device. Tap on Summary option and then tap Check for Update option. Now click Download and Update. If asked for your passcode, enter it and your update will start. Well, if none of the solutions work, then use Tenorshare ReiBoot. It is a tool that comes handy for solving issues such as this. It is also used for entering and exiting from Recovery Mode that too with a single click. In short, it is the ultimate solution to any problem that your iPhone or iPad or any other device faces. Here is a step-by-step guide for you to follow in order to solve update failure issue. Launch the software on your PC and plug in your device. Now click on "Fix All iOS Stuck" option. Once you are done with Step 1, tap on "Fix Now" option that appears on the next screen and download the latest firmware package suitable for your device. In order for the process to begin, you must click Download option. As the process is concluded, click "Start Repair." After some time, your iPhone will automatically update and reboot with the latest iOS version. IPSW files are issued from Apple and are aimed to include new functions and fix security issues in compatible devices. Here are the steps for you to follow to install these files manually and solve the issue. Make sure you have the latest version of iTunes on your PC and the IPSW file already downloaded. Plug your iPhone to your PC. Run iTunes and choose your device. If you are using Windows computer, hold down "SHIFT" key and tap on "Update." If you are using a Mac computer, hold down the "Option" key and then tap on "Update." Choose the IPSW file you downloaded and tap "Choose." Next, leave on the operating system to update the device. All in all, we had a look at the best 7 solutions that can fix iPhone software update failed. So friends, do let us know your feedback on this solutions. You can do this by commenting below. Also you can write to us if you have any possible solutions related to the same issue. Do let us know by commenting below.